Inspired by Tom Schindl’s e(fx)clipse (see his blog), I have spent some time investigating the CSS styling capabilities of JavaFX 2.0. I have to admit I like it a lot! The styling provides everything out of the box that I had wished for. The only thing that bothers me about the JavaFX rendering right now is that sub-pixel anti-aliased font rendering is not supported yet. This make all fonts appear blurred on LCD screens. But I hope that this will be fixed soon, there are already some bugs filed in the JavaFX Jira. The next steps for me would to port the e4 Contacts Demo to Tom’s e(fx)clipse to have a working application. 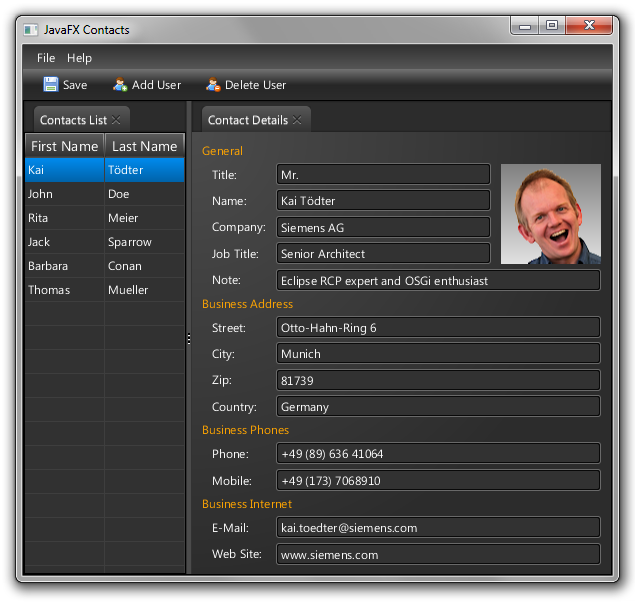 One last thing: If you are a designer, could you provide me with a real great looking dark CSS theme for JavaFX 2.0? with Netbeans IDE 7.1 Beta, so i got a few questions. Is the Eclipse Community adopting JavaFX as a replacement of SWT? Is E4 coming too late? If Jigsaw makes it into JDK 8, what does this mean for Eclipse OSGi? 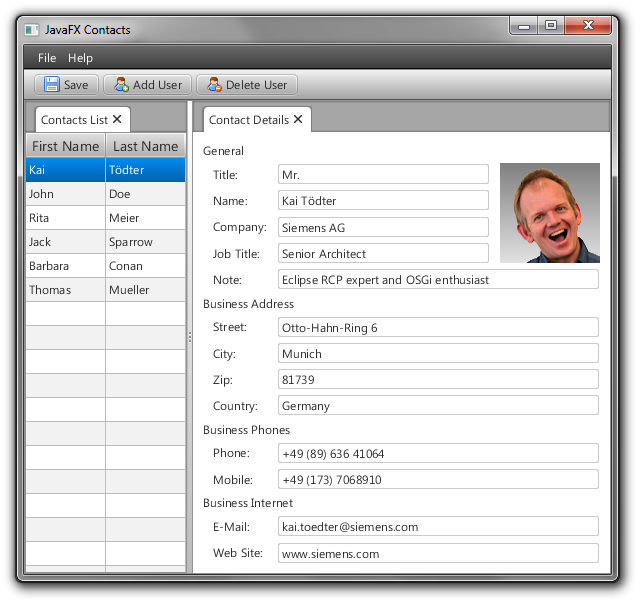 Could you please provide the JavaFX source code of the contacts demo? Though I don’t know what IDE Kai used e(fx)clipse provides Eclipse with Tooling for JavaFX and at least what I’ve seen 7.1 Beta e.g. the CSS-Support is way better in my tooling compared to what Netbean provided. ad) SWT replacement + e4: The Eclipse 4.x Application Platform (the new runtime layer Eclipse 4 is built on) is a widget toolkit neutral RCP-Platfom if you read my blog you should get what I mean. SWT by its nature can’t do what JavaFX does when it comes to styling. Very cool, Is there way to switch the theme at runtime? @Kurt, the source for the mockup is pretty trivial, I did not use fxml but created the GUI using the Java API. I did not try Netbeans 7.1 beta yet, but when I have time I’ll take a look at it. I basically used the Eclipse 4.2 IDE together with Tom’s e(fx)clipse tooling. Yes. CSS-Stylesheets can be added and removed at runtime in JavaFX! e(fx)clipse has an extension point to build up the styles from multiple bundles and groupe them into so called themes. @Christian, would it be interesting for Riena? @Bob Balfe, yes, dynamic changing works well, but currently it does not work perfectly. For instance, if I start an app without css styling (using the default caspian css), than add my dark css style to the scene and remove it again, the result looks a bit different. Currently the object selectors like .my-gridpane are not removed completely. A workaround is to make sure that all (new) selectors exist in all style sheets, than the result looks like as expected. Do you have the sources for this somewhere so we can use it to learn further? Can we add background image to HBox? can i have the code pls? I loved your app so much I decided to work on a copy of this app. My version scans an vcf file and populates the app from the parsed data.